7:00 am – Ted is up early frantically refreshing his menu. After a few tense minutes, he finds the entree he is looking for. Turkey FastPass is secured. He rounds it off with a Stuffing FastPass, then picks up a burner FastPass for Romaine Lettuce Salad. 6:08 pm – Shane and Ted go over the food script. The plan is to rope drop the desserts, figuring that most people are saving those till the end. The FastPasses will not kick in until the second hour so they hope to clear as many small desserts as possible before course-hopping to entrees. 7:20 pm – They spend the evening planning the outfits for the big day. Belts are loosened by two notches. Backup stretchy pants are stored safely within reach. A last minute emergency sends Shane on a trip to secure extra napkins. Thanksgiving Day – One Meal. Every Food. 11:00 am – Team Parkeology arrives 1 hour before the posted meal time. They are the first in line. 11:50 am – With larger than expected crowds building, the Opening Prayer kicks off 10 minutes early. 1:55 pm – Carrots is next on the menu as the team falls victim to the proximity trap from Peas. They are now cutting it close and will need to course-hop to Carbs or the meal will be prematurely over #thanksgivingchallenge Food 15. 2:25 pm – In line for Fruit Salad. Taking forever. 2:35 pm – Still no Fruit Salad. Bowl might be out. No word yet from the chefs. According to Twitter, Fruit Salad has been having problems all day with watermelon seeds. 3:00 pm – Another course hop. 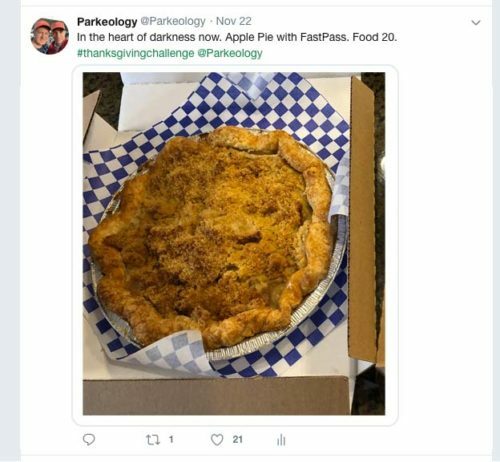 Team Parkeology wades back into desserts. Time for that Apple Pie FP. 3:10 pm – Just two guys in their 40s, eating Jello with Marshmallows inside. Nothing wrong with that. #thanksgivingchallenge Food 21. 3:20 pm – The guys polish off a scoop of Ice Cream. And with that, they earn their first badge. Desserts complete! #thanksgivingchallenge Food 22. 4:29 pm – Last minute hop on to the mother of all Thanksgiving foods… Mashed Potatoes and Gravy! We did it! That’s a full completion of all 29 foods in a single meal! And we mean full completion. We’re stuffed! 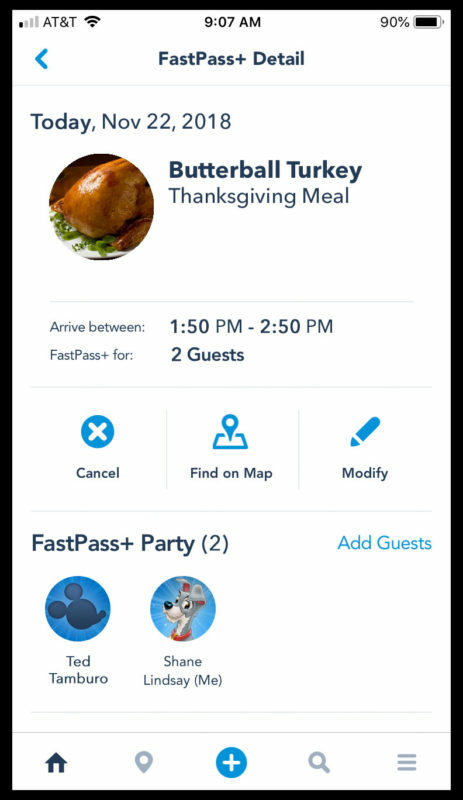 It’s the happiest Thanksgiving that Team Parkeology could hope for. 5:01 am – In line at World of Disney for Black Friday deals. 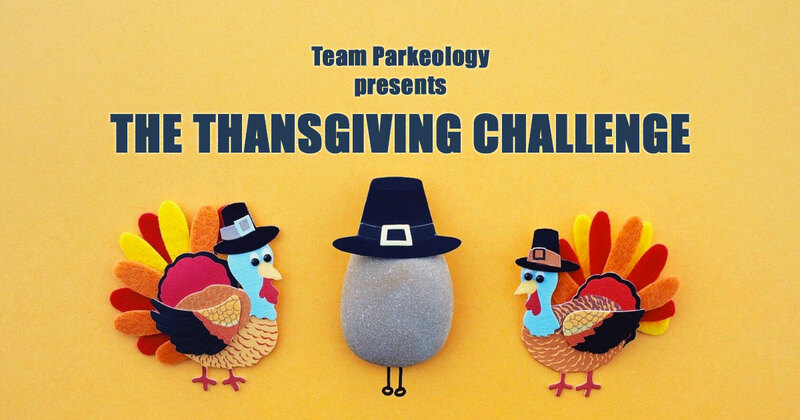 This entry was posted in Theme Park Life and tagged holiday, parkeology challenge, thanksgiving. Bookmark the permalink. Oh, man. I should NOT have read this after a big dinner. Urp. Help, I’ve fallen and cant get up I’m laughing so hard! Nice job. Thanks! Challenge veterans can especially appreciate it! When I first saw the title, I admit I really thought you madmen had attempted the challenge on Thanksgiving of all days. While I won’t say wasn’t dissapointed to find out I wad wrong. Still a super fun read. You should document a run together again soon though! Thanks Neon! Hope you had a fun thanksgiving. Ted claims he is retired from running. But I’m always working on him. You need to convince him asap! I’m not sure it will really be possible anymore post Star Wars land opening. Next half a year or so might be the last real window. Surprised Romaine Lettuce Salad wasn’t closed. Well it didn’t have anybody in line. Why do I feel sick? Good stuff! Pretty sure I gained a few pounds just reading it. Happy Thanksgiving to you both!